CCJI co-directors Professors Janis McDonald, left, and Paula Johnson with Keith Parker, chair of the National Civil Rights Conference. The Cold Case Justice Initiative (CCJI) at the College of Law received an award during the National Civil Rights Conference in Philadelphia, Miss., on June 15. The Civil Rights and Social Justice Award was presented to CCJI for its body of work in support of human dignity, civil rights and/or social justice. The Cold Case Justice Initiative at the College of Law conducts investigations and research on unresolved cases, public forums and other special events, and serves as a clearinghouse for sharing and receiving information on active cases. The CCJI insists on vigilant attention to these long-unresolved racially motivated killings and continuing issues of racial justice; its focus always on victims’ families. 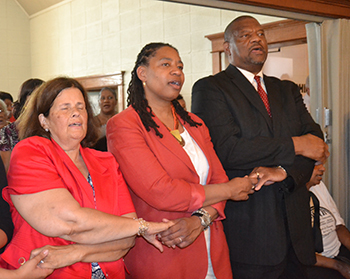 Over the last year the CCJI has joined with the NAACP and the Southern Christian Leadership Conference, drafting resolutions with both organizations, calling on the U.S. Attorney General to fully implement the Emmett Till Unsolved Civil Rights Crimes Act. Additionally, the CCJI sent student workers into five southern cities last summer to begin to take a full accounting of racially motivated killings that may have occurred during the period between 1955 and 1980. Cities included Atlanta; Nashville; Baton Rouge, La. ; Jackson Miss. ; and Jacksonville, Fla. Thirteen students conducted document research and participated in dialogues in these communities to identify and find residents who believe they lost loved ones in racially motivated crimes during the civil rights era. Review of materials and investigations are ongoing.